PHOENIX - June 18, 2018 - PRLog -- monOrchid is pleased to introduce our newest represented artist Michael Viglietta! The New York born contemporary abstract artist found himself in Los Angeles after graduating college to pursue a career in movie and television production. After years in the industry, Viglietta began focusing on his hobby of painting. Fast forward a few years, and the dexterous Phoenix based artist is bringing a new flavor of art to monOrchid's gallery walls for his mid-September solo exhibition. 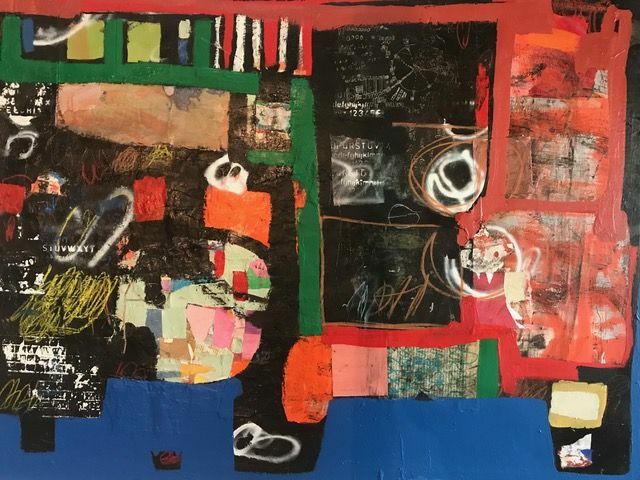 Viglietta is drawn to the process of layering, removing, and thickening a variety of mediums to his canvases - finishing with a diverse display of colors and textures. He references this method to an archaeologist's digging, figuratively inserting his own artifacts to later be discovered. When he isn't striping layers of oil paint and newspaper clippings off his canvases, the artist can be found hiking Arizona trails and traveling around the country. Michael Viglietta's solo show will be displayed in September 2018 but we invite you to view a handful of work during the up and coming show presented by monOrchid, "The Coterie Exhibition" - June 23, 2018 through September 7, 2018.